It’s that time of year. It’s the holiday season. There is cheer and excitement around every corner. There are carols and decorations and treats and bows and gifts everywhere. It’s the season of joy! But… Are YOU feeling joyful? I grew up LOVING the holiday season and I still do. I enjoy the anticipation of Jesus’s birth. I enjoy the time with family. I really do. But. The stress. The commercialism. The pressure to do it all well. The list is so long already and it just keeps getting longer! Before the holiday season I went through a dry season. 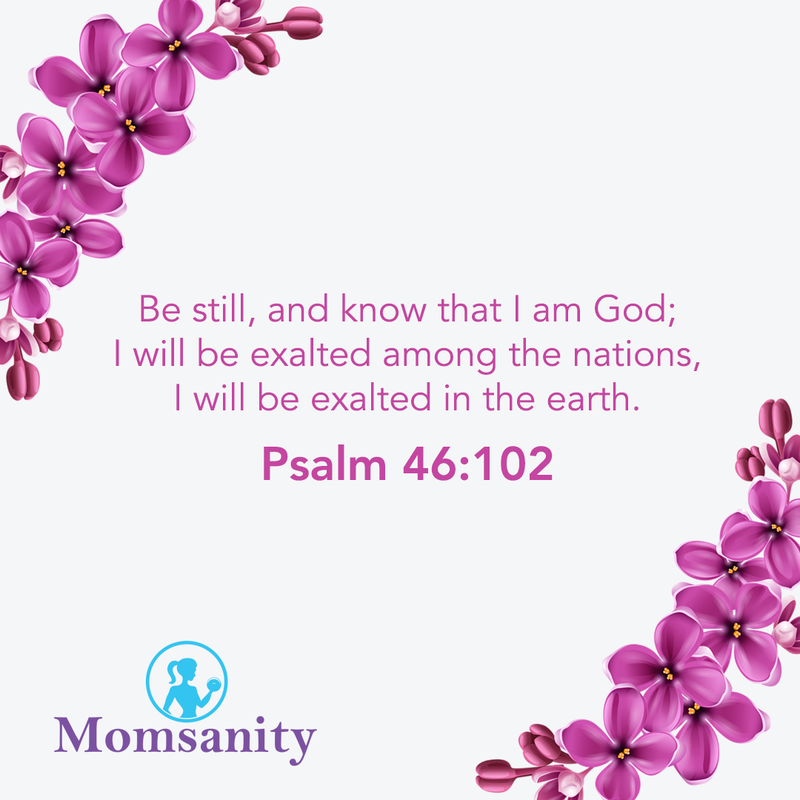 My husband was recovering from an Achilles tendon rupture (and still is), we had huge projects on our plate (hello Mom Fuel launch), my boys were both going through challenging seasons (strong willed almost-5-year-old plus toddler), and my to-do-list just kept getting longer. I sacrificed sleep and quality time with those whom I love to get it all done. The worst? I was rushing through my time with the Lord and taking ZERO downtime. I had no time of stillness. No time to just listen to God. No time to soak it all in. My life is so good, yet sometimes I feel so numb and so dry. I tell you this transparently because I know you have these seasons too. And sometimes they happen when everything is going GREAT. My good friend Michelle Myers calls it Holy Hangover. Our lives are full of good things, but full nonetheless. We simply cannot pour from an empty cup. We just can’t. On Thursday my car was having major problems and was in the shop all day so I had to adjust my schedule. On Friday I had a dead battery so I had to once again slow down. My plans got completely jacked up 2 days in a row and I about lost my marbles. Truth time. I told my husband I couldn’t figure out what in the world was wrong with me. I am living my dream life, yet here I was incredibly emotional and volatile. I was so mad at myself. Why is it that despite my best efforts, I can’t do it all well? Why did a few TINY bumps in the road make me spiral out of control? Clearly I was missing the mark. How could some small first-world inconveniences affect me so much? He quickly put me in my place. He said “Emily, you’re thinking you’re feeling convicted, but really you’re condemning yourself”. What? I sat there and thought about it. He was right. GOD didn’t expect me to do all of this just right. Wiggy didn’t expect these high standards. My kids definitely didn’t and neither did Coach Debbie. I was the source of my stress AND the cause of my distress. Maybe these stumbling blocks were actually a wake up call from God reminding me that I am NOT in control and that I don’t have to strive so hard to make sure every single second goes according to my plans? That day I allowed myself just a small breakdown. I confessed to God that I had been trying to BE GOD rather than LET God. I asked Him to please reveal Himself to me and remind me of His will. No less than 5 minutes later I got an encouraging text from a friend. Then a few minutes after that I ran into a new Momsanity Sister for the first time who left me feeling encouraged. I received a thank you note in the mail from a friend who had just moved into town, another encouraging note from a dear friend who was “just thinking of me”, enjoyed time with my BFF, spent HOURS in God’s Word focusing on JOY, read my new spiritual discipline book (also about JOY), listened to a sermon at church (also about JOY), and celebrated with a dear friend who was baptized. God showed up! He reminded me that it’s ok for me to breathe. He reminded me that my joy is not in my circumstances or checking everything off my list. 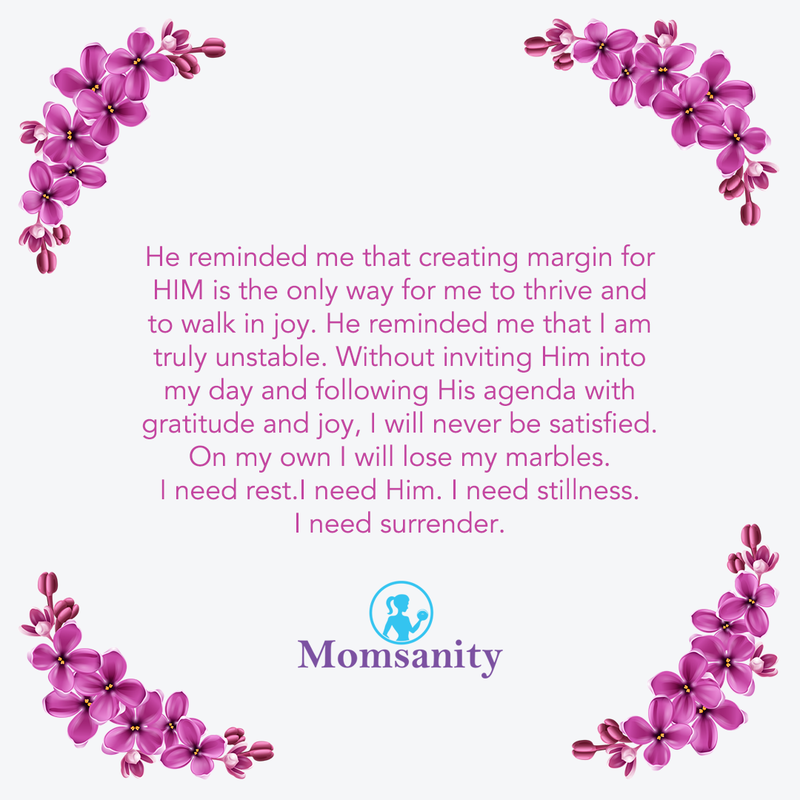 He reminded me that creating margin for HIM is the only way for me to thrive and to walk in joy. He reminded me that I am truly unstable. Without inviting Him into my day and following His agenda with gratitude and joy, I will never be satisfied. On my own I will lose my marbles. I need rest. I need Him. I need stillness. I need surrender. You need these things too. As we approach a busy holiday week may we set our agenda aside and relish in the amazement of what we’re about the celebrate. May we be reminded that we can trust our God who sent our Savior in the form of a baby to an unwed mother who gave birth in a barn. He will never ever leave us. Even when we’re not “feeling it” we can know that He has designed our steps and we can stop wrestling and trying and striving. We can just be His girls. We can trust that He will make all of the things that He has planned for us possible. Sit back. Breathe. Relish. Pray. Celebrate.